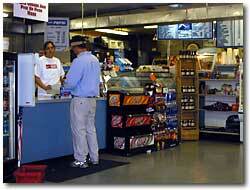 Battleview Market and deli is owned and operated by Peggy Myers. Peggy purchased the market from Abbie Draper on February 15, 1994. Prior to the acquisition of the market, Peggy worked in the restaurant business for 16 years. She knew by purchasing the business it would be a big undertaking. Peggy knew the merits of owning a store like Battleview Market. She had small children, all in different after school activities. She knew there were a lot of people in the same situation that needed a place that provided good quick meals for those on the run. She also knew Battleview Market provided a great lunch for the local workers. So Peggy took the challenge, purchased the market, and it has grown to become a popular convenience store specializing in fresh home-cooked food. Battleview Market has a wonderful local customer base and in the summer enjoys many tourists stopping by for a quick meal before touring the Antietam Battlefield. Battleview Market currently employees 18 people. It strives to make improvements to continually keep their customers happy and make them feel like family. Recently we are very excited to open our 3 acre field for groups to hold club events. So please stop in and see us soon!! !